Oort Online has become… Boundless | Boundless – Explore, Collaborate, Build, Conquer, Discover. 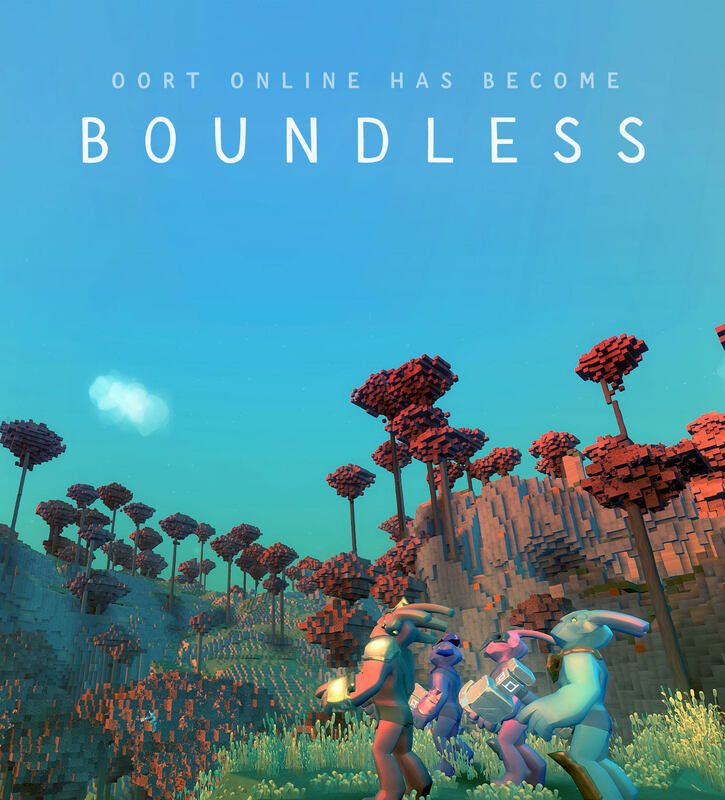 Today we’re excited to announce that Oort Online has become Boundless! Boundless is a word that describes the huge, open-ended aspect of the sandbox. It describes players’ Boundless imaginations when creating, the Boundless opportunities to visit new places and meet other players, the Boundless ways you can exploit the in-game economy, and the Boundless variety of creatures you’ll discover. Boundless is a game that doesn’t limit your creativity, expression or exploration. Boundless is a big, punchy and impactful word. It describes the feeling of the game in a way that got us really excited. It’s a name that gets you excited even if you don’t know anything about the game. It doesn’t require explanation and it isn’t hard to pronounce or spell. It was a name the whole team got behind — that’s how we knew it was the one. As you can probably tell, we were really excited to announce this. We’ve been teasing it for a while, so bonus points if you can find posts from us containing the words ‘bound’ and ‘less’. Lots of games have code-names or pseudonyms during early stages of development. For example, did you know Fable was called ‘Project Ego’ before it was announced? We’re living our development process out in the wild, name changes and all. When we chose the name Oort Online we didn’t know as much about the game as we do now. It was over a year ago and the game wasn’t even announced to the public. We had ideas about what the game could be, and might be, but we didn’t know for sure. And now it feels like Oort Online isn’t the best name for the game we’re making. We know a lot more about Boundless now, and we think it’s time to give it a name befitting of its scale and our ambition. What happens to The Oort? This name change doesn’t alter our ambitions for lore, backstory or narrative. Everything we’ve shared to date is still in the plan. ‘The Oort’ are still ‘The Oort’, they aren’t ‘The Boundless’ (although hey, that’s not so bad!). The names of many things will change through development, but not just because we changed the name of the game. Over the next week we’re going to transition the site, domains, Twitter, Facebook, forum, Steam and app over to the Boundless name. There’s even a new trailer coming next week (finally!). The changes aren’t all going to happen all at once (seriously, there’s like a million places to change it) so please bear with us as things are changing.